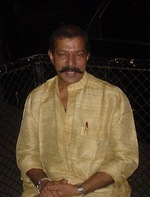 It is hard to believe that it has been five years since this charismatic actor bid farewell � 6 August 2014 is Bharat Murali�s fifth �Remembrance Day�! People remember him for his inimitable acting, depth of his voice, the books he has written and most of all, his most expressive eyes that could convey volumes with just one look! But for his friends, he was someone who ignited their days with his intelligence and sense of humour � and for his family, he was a loving husband and father! 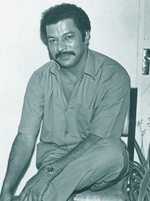 He was not just an actor on the silver screen, but much more than that; a writer, stage actor, a politician, and the one who took Sangeetha Nataka Academy to new heights as its Chairman, to mention a few of his accolades.The Drama Festival he organized was first of its kind in India and he was planning an 'Indo-African Drama festival when he was suddenly taken from us! He had many more dreams and plans: a book on the Ancient Art forms of Kerala, great plans to bring 'Karnnan' and 'Kari Gurukkal' to our stages in the style of 'Lankalakshmi',etc. 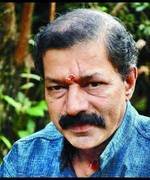 Murali had so much more to give and his demise was so untimely and sudden that most people found it hard to believe! Kaavaalam Narayana Panicker�s dramatization of Asan�s �Veenapoovu� would have been another jewel in the crown � but sadly, that was not to be! He was truly a mine of inexhaustible talents, which may not be fully known even to many of his admirers, as he was very unassuming! Family and friends along with his adoring fans remember him today more than any other day. His birthplace, Kudavattoor is getting ready to have a library in his honour and the construction is already in progress. A special ceremony would be held this morning at Murali's resting place, 'Shanthi theeram' at Aruvikkara and few of Murali's books, including �Abhinethavum Asan Kavithayum�, would be presented for the library in Kudavattoor -- there is a great function this evening in Kudavattoor to celebrate the life of its famous 'Son'! The book titled, 'Bharath Murali Holy Actor', a compilation of articles about the 'Acting Phenomenon called, 'Murali', written by various writers, Film Directors, Politicians, actors and friends, edited by Bhanuprakash was published by 'Olive Publications' in August 2010 to coincide with Murali's 1st Remembrance Day -- a second edition was released last year! Another literary legend, M T Vasudevan Nair wrote the foreword, ending with this tribute, "Loosing Murali was not just the loss of an 'Actor', but it was the loss of a 'Genius', who had the cultural consciousness and the restless longing of the whole of an epoch in his very soul"! It is then, no surprise that 111 distinguished people from different walks of life found it so easy to write about this 'Genius of a man', starting with Sukumar Azhikkod, KP Appan, Narendraprasad, D Babu Paul,T Padmanabhan, Ayyappa Panicker, Kavalam Narayana Panicker, Kadamminitta Ramakrishnan, Kaakkanadan, Adoor Gopalakrishnan, Hariharan T, Venu Nagavally, Kamal, Lohithadas, Sathyan Anthikkad, Sibi Malayil, KG George, P T Kunjumohamed, Priyanandanan, TV Chandran, Mohanlal, Mammootty, Pramod Payyannoor, who was behind the brilliant production of Murali's 'Lankalakshmy in London! ), and many more! The book has 701 pages in eight sections, covering the different aspects of Murali's life, including the two articles by his wife, Shylaja and his daughter, Karthika, Interviews, bibliography of his films along with beautiful photographs, including a few rare ones! 'Abhiayathinte Rasathanthram' written by Murali replaced the 'Autobiographical section', as destiny intervened before he could write it! The title, Holy Actor', was apt for Murali, as he was truly a 'Holy Actor': "Holy Actor is one who experiences and incarnates archetypes" (Jerzy Grotowsky, the Polish Theatre Director) A must read for all! Murali�s passing left a big void on our silver screens that has not been filled yet, and I doubt if that will ever happen -- I am saying this not forgetting the other talented actors, but the likes of Sathyan or Murali are inimitable and unique. Murali�s Bapputty (Aadharam), Krishnaprasad (Bhoomigeetham), Raghavan (Valayam), Esthappan (Chamayam), Sekharan (Pathram), Lance naik Nambiar (Chakoram), Hafisali (Neeyethra Dhanya), Ramachandran (Arthana), Sankaranunni (Thaalolam), DK (Lal Salaam), Gopalan Moosaari (Venkalam), Chakkapponthan (Mathilukal), Appa Mesthri (Neythukaaran) or Kari Gurukkal (Puli Janmam), still amaze the audience! It does not make any difference whether he is a hero or a villain in any of his films -- he has this unique quality that makes the audience remember even the name of his character in each film even after many years! It was amazing how he could recite the works of Changampuzha or Kumaran Asaan from memory, captivating the listener! He had an in depth knowledge of literature, world politics and humanitarian causes. Kamal's �Bhoomigeetham� brought us Murali's singing voice and 'Krishnaprasad'! ONV's lyrics attained eternity, when Murali sung �Parayoo Nee Hrudayame...�! 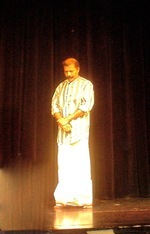 Narendraprasad�s �Natyagriham� brought out Murali�s talent on stage � �Moonnu Prabhukkanmar, Souparnnika, Shanidassa, Velliyaazhcha and Marthandavarma Rakshapetttathengane� are few of the examples. Murali had this passion for �Asan Kavthakal� and acting, and a never-ending quest to delve into the inner core, that he wrote books about them, �Abhnayathinte Rasathanthram and �Abhinethavum Asan Kavithayum�, both of which should be made part of the University curriculum! He has acted in around 200 films, stage plays and serials, and written six books: �Murali Muthal Murali Vare, Mrugasalakkatha (Translation of Edward Albee�s Zoo Story�) Vyazhapporul (Sivaram Award), Abhinethavum Asan Kavithayum (Sangeetha Nataka Academy Award), Abhinayathinte Rasathanthram (M.C.Appunni Nambiar Award) and Arangettam�. Many awards came his way -- chosen as the 'Nation's Best' for his acting in �Neythukaaran� (2001), received �Kerala's Best Actor Award�, four times: Aadharam (1992), Kanakkinavu (1996), Thaalolam (1998), Neythukaaran (2001), and the best supporting actor award, twice: (Amaram (1989), Veeralippattu and Pranayakalam (2007) -- and many other awards followed! I reveal just a few from the top of my list: �Adharam, Arthana, Lal Salam, Dasaratham, Bhoomigeetham, Sakshyam, Neeyethra Dhanya, Panchagni, Garshom, Magrib, Chakoram, Chamayam, Venkalam, Amaram, Pathram, Thalolam, Meenmaasathile Sooriyan, Dhanam, Erattakkuttikalute Achen, The King, Kaarunyam, Valayam, Aardram, Pathram, Mathilukal, Kanakkinavu,Amma Kompathu Achen Varampathu, Gramaphone, Ekaantham, Neythukaran and Pulijanmam�, and many more! He had this amazing talent to make the audience feel at home with all his characters � DK, Ramu, Esthappan, Sekharan, Hafisali, Nambiar, Gopi Master, Appa Mesthri, Raghavan or Bapputty more than the others, or truly all of them, perhaps! 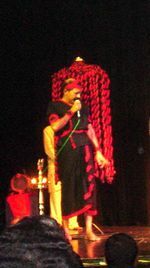 He has done something on stage that most actors could only dream about � he transformed himself to Ravanan as a single act in C.N. Sreekantan Nair's �Lankalakshmi�! His performance in London, a single act lasting around seventy minutes was so bewitching that he was given a standing ovation. He, on stage, transformed himself into many characters just by mere acting, �Raavanan to Vibheeshanan, Angathan, Maalyavaan ... to Meghanaadan�, at lightening speed that the spectators were spellbound -- and a lesson in acting itself! Murali delved into the inner core of each character he played and I felt that a part of those characters remained in his psyche, refusing to part with him. He has immortalized his characters, and his style of acting and dialogue delivery are inimitable, sleek, subtle and yet, very powerful, laced with tenderness and love when the situation demands. His calibre is such that I would place him next to Laurence Olivier, Richard Burton or Jack Nicholson, perhaps even higher -- but for Malayaalees, Murali's place would be next to Sathyan, and that would be the highest of all awards! However, I feel that Murali was not given the recognition that he truly deserved, but then, he never went after the awards or super-stardom, or talked about it, as he was much above that � he was happy with the love and admiration of his ardent fans and real friends! He believed that religion and Communism could find a common ground � �Chandanam�, Kunkumam and �Rudraksham� competed with 'Communism and the inner turmoil', but he knew it was a loosing battle. Ideology and spiritualism with his high aesthetic values and intellect pushed him in his never-ending quest for inner peace � perhaps, this restless quality in Murali, the angry restlessness and the resigned smile at times, on screen and off it, is what made the common man identify with the great actor and admire him with a special fondness. He is no more, but his spirit and his legacy are with us for ever! And our thoughts are with his wife, Shylaja; daughter, Karthika, and his mother. We will miss you always! May your find peace at 'Shanthitheeram'!